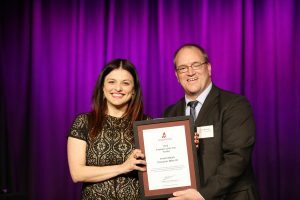 On October 22, the hardware industry of Victoria and Tasmania came together for its yearly night of nights with the hosting of its 2016 Victorian/Tasmanian Hardware Industry Awards. 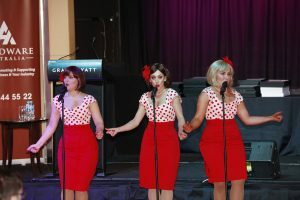 The room was packed to capacity to enjoy with guests not only treated to a night of awards, but also entertainment and fine dining at the Grand Hyatt in Melbourne. Recipients of the 30+ Years’ of Service Awards. 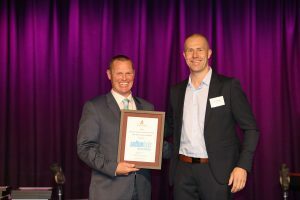 Tynan Murry, Airco Brands’ Victorian manager accepts Bathroom Supplier of the Year Award for Interbath, presented by Mitre 10’s Greg McKean. Catherine Callaway of Mapei accepts the Building Supplier of the Year Award, presented by Mitre 10’s Greg McKean. 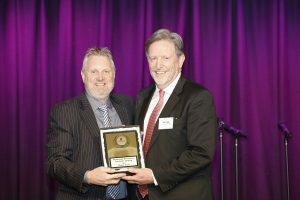 David Cripps of Yates (R) accepts the Garden & Outdoor Supplier of the Year Award from HTH Vic/TAS regional manager HTH, Tony McGeorge. Andrew Coffey of ITW Proline (R) accepts the Hardware Supplier of the Year Award from HTH Vic/TAS regional manager HTH, Tony McGeorge . Dulux Victorian manager, Colin Jeoll (R) accepts the Paint and Accessories Supplier of the Year Award from Mitre 10’s Greg McKean. 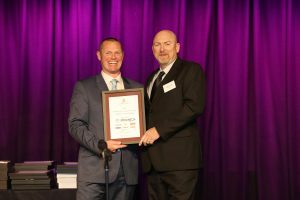 Ben Williams of Sutton Tools accepts Tools and Accessories Supplier of the Year Award, presented by HTH Vic/TAS regional manager HTH, Tony McGeorge. David Cripps of Yates (R) accepts the Overall Supplier of the Year Award from HA chair, Ian Cornwell HA Chair. 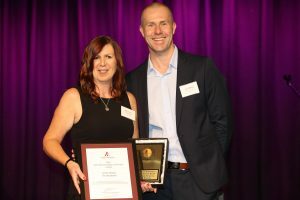 The Lou Turco Sales Representative of the year Award was this year sponsored by Sutton Tools and was awarded to Jenny Davies from Trio Australia. 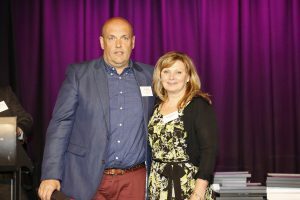 Jenny Davies of Trio Australia accepts the Sales Representative of the Year Award from Ben Williams of Sutton tools. Jenny won the award against some tough competition and during her acceptance speech, Jenny said she was completely stunned by the win. Jenny also said she was very thankful to Trio as a company for their support. 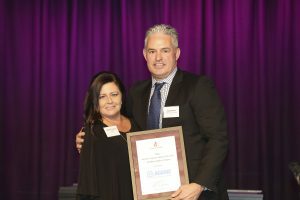 Paul Drake of Ocean Grove Home Hardware accepts the Small Store of the Year Award from Robyn Stewart of Seasol. Steve Longmore of Wells Mitre 10 La Trobe accept the Medium Store of the Year Award from Andrew Coffey, ITW Proline. Paige O’Connor of Diamond Valley Mitre 10 accepts Large Store of the Year Award from Constance Bram of Valspar. 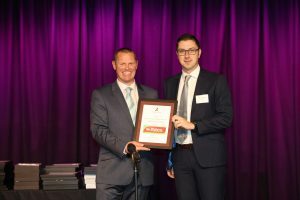 It was especially exciting to see Wells Mitre 10 Latrobe in Tasmania feature in the winning stores, with the store owners travelling from interstate, to attend the awards night and accept the award, according to Hardware Australia’s executive officer, Scott Wiseman. 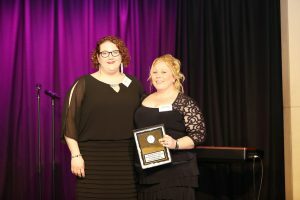 Sponsored by REST Industry Super, the Employee of the Year award was presented to Jessica Mauro of Doncaster Mitre 10. Jessica is Doncaster Mitre 10’s paint manager, and is described as their ‘Jill of all trades’ with six and half years’ building understanding across many departments. Jessica was honoured and humbled to have been nominated and was ecstatic to have won and receive the $500 cash. 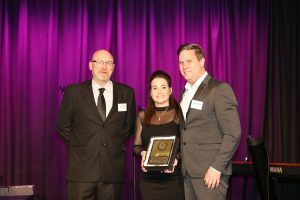 Employee of the Year award was presented to Jessica Mauro of Doncaster Mitre 10, by Hardware Australia chief executive, Scott Wiseman. 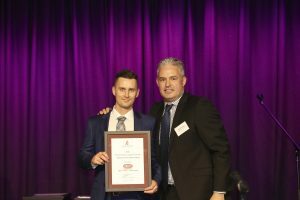 Sponsored by National Retail Association, the 2016 Rising Star of the Year Award was presented to James Domaille of Doncaster Mitre 10. James took home not only $500 cash, but also a $4000 training voucher to further his development and will represent Victoria in the National Hardware Awards in early 2017. 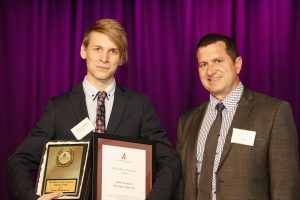 James Domaille of Doncaster Mitre 10 accepts the Rising Star of the Year Award 2016 from the National Retail Association’s Troy Wild. 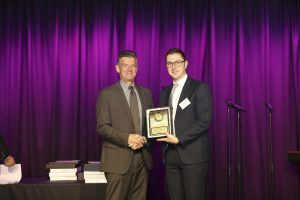 Sponsored by Dulux, the major award of the night, the Hardware Legend award, saw Colin Jeoll from Dulux presenting Barry Fagg – Fagg’s Mitre 10 with the award. Barry was acknowledged for a lifetime in the industry and his outstanding contribution to Mitre 10 over many years. Barry is part of the fourth generation of the family to devote a lifetime to the hardware industry and has successfully carried on the traditions of his Geelong business, which has over 160 years of history. The Fagg’s business is one of the longest running family businesses in Victoria and the eighth oldest family business in Australia. After a career in accounting, Barry joined the business full time in 1980, together with his younger brother Keith. Backed by the support from the company board, the brothers grew the business from two stores to five, and now has stores in South Geelong, North Geelong, Wallington, Torquay, Colac and more recently in a joint venture with Mitre 10. Barry was a director within the Mitre 10 group including Mitre 10 Southern Region and Mitre 10 South West from 1987-2004, and served on various committees during this time. In 2000 he became an inaugural board member of Mitre 10 and was chairman of the board from 2002-2004. Barry is most proud of working together with his brother to successfully continue and grow the family business for over 35 years and his accomplishments as national chairman of Mitre 10. Over his time in the industry, Barry notes the introduction of big box hardware retailing and computerisation as among the major changes to how we do business and also welcomes the involvement of Metcash in the industry as part of securing the future of independent hardware operators. He believes we will continue to see the consolidating of independents who will survive by being specialist in their areas and in serving niche markets. 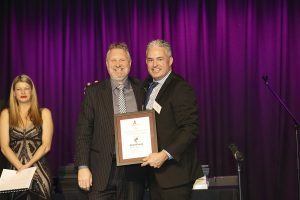 When accepting the award, Barry paid special tribute to his family, his brother who he works closely with and to his wife, who has visited thousands of hardware stores all around the world. Colin Jeoll from Dulux presents Barry Fagg, of Fagg’s Mitre 10 with the Hardware Legend Award. 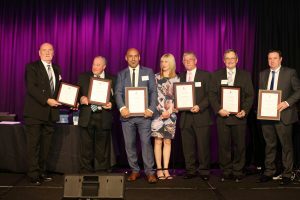 Hardware Australia’s executive officer, Scott Wiseman, said the night was a great success as a celebration of our great industry and the special people who are passionate, dedicated and genuinely love hardware. “Please remember to support these companies who generously support these industry events,” Mr Wiseman said.